3.7 out of 5 based on 23 bloggers and 3 commenters. 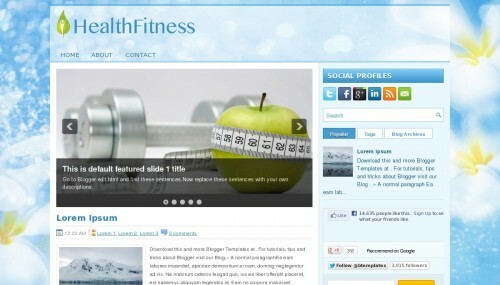 HealthFitness is a free blogger template adapted from WordPress with 2 columns, right sidebar, fresh look, slider, social bookmarking icons, tabs, girly looking and floral motifs. Excellent template for blogs about family, fantasy, health and beauty or nature. I don’t know want to replace the picture slide show..
Love this template – but the comments on all my posts (both the comments directly to the post and the ones thru Google+). I’ve added the line of code: “” but it didn’t work. What next? Thanks.